The world has been repeatedly plagued by infectious disease outbreaks, including SARS and MERS coronaviruses, avian influenza viruses, and Zika virus. A team at the Medical Faculty of The University of Hong Kong (HKUMed) led by Professor Yuen Kwok-yung and Dr Shuofeng Yuan of the Department of Microbiology, has discovered a novel broad-spectrum antiviral drug that would be strategic for epidemic control and early treatment with better clinical outcome. US provisional patent application has been filed for this important discovery. The finding is now published in a leading scientific journal Nature Communications. It is difficult if not impossible to predict the coming virus epidemic. It will definitely come but do not know which virus. Thus it is not possible to develop a drug that will specifically inhibit that coming yet unknown virus. It would be ideal if we have an antiviral drug which targets a host pathway that is essential for virus replication. 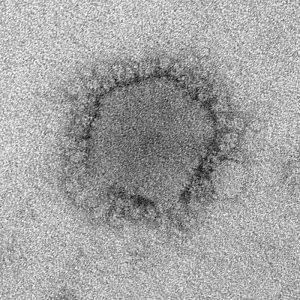 Our past experience shows that respiratory viruses are the most likely emerging virus that can cause huge morbidity, mortality and socioeconomic disruption such as the 1997 H5N1 and 2013 H7N9 avian influenza viruses, and the 2003 SARS and 2012 MERS coronaviruses. The study of these diseases and their pathology showed that coronaviruses often use the lipid membrane synthesis pathway of human host to produce intracellular lipid membrane vesicles as the machinery for producing virus particles. If we can find a host target which control lipid production, we can find a drug that targets this host target and therefore stops virus replication. Using integrative transcriptomic and lipidomic analyses, it was shown that cellular lipid metabolism is profoundly upregulated with MERS coronavirus infection. Followed by this, a bioactive lipid library was screened and AM580 was identified as a potent and broad-spectrum antiviral (respiratory or emerging RNA and DNA viruses) with high selectivity indexes in cell lines, and as a safe and effective anti-MERS and anti-influenza treatment in mouse models and human organoids. Using click-chemistry, the sterol regulatory element-binding proteins (SREBPs), which are transcription factors regulating cellular lipid homeostasis, were identified to be the target of AM580. The novel findings in the current study demonstrates that SREBP, a host factor which is essential for viral replication but can be temporarily non-essential for the host metabolism, represents an ideal target for the development of broad-spectrum antiviral therapeutics. Notably, a chemical derivative of AM580, tamibarotene which is not a cytotoxic but a differentiation drug, has been used clinically for the treatment of acute promyelocytic leukemia with little side effects. With the clinical experience of tamibarotene, AM580-related compounds could be modified as a safe and broad group of antiviral therapeutics.